October 1, 1947 - The Chicago Transit Authority begins operating Chicago's rapid transit trains after purchasing the privately owned Chicago Rapid Transit Company for $12 million. March 27, 1948 - Skokie service between Howard Street and Dempster Street is replaced by buses. The Chicago North Shore & Milwaukee Railroad interurbans would use this trackage until it folds in 1963. April 5, 1948 - To speed up service (slow due to two track lines and old wooden trailers), the CTA introduces A/B skip stop service on Lake Street Line. Under this system, stops are coded "A", "B" or "AB". Trains are also "A", "B" or All Stops. The "A" trains stop at A stations and AB stations, B's at B and AB stations and All Stops at, well, all stops. This express service began during rush periods only, but spread to all day later. At the same time, ten low use stations were completely closed: Lombard, Menard, Kostner, Sacramento, Campbell, Oakley, Damen, Ashland, Racine and Morgan. Lake Street service is also discontinued to Market Street terminal. July 31, 1949 - The CTA institutes its massive North-South service revision. Service is streamlined into the following routes: Howard-Englewood, Howard-Jackson Park, Ravenswood (Kimball-Loop), and Evanston (Linden-Howard during non-rush hours, Linden-Loop during rush); as well as the following shuttles: Kenwood (42nd-Indiana), Stock Yards (Stock Yards-Indiana), and Normal Park (69th Street-Harvard). A/B skip stop service is instituted on the Howard, Englewood, Jackson Park and Ravenswood routes, and 23 low-use stations are closed: Ravenswood, Buena, Clark, Grace, Wrightwood, Webster, Halsted, Larrabee & Ogden, Schiller, Division, Oak, Grand, Roosevelt, 18th, 26th, 29th, 31st, 33rd, Pershing, Princeton and Parnell, as well as the Congress Street and North Water Street stub terminals. September 17, 1950 - The first of the new all-metal PCC 6000-series transit cars are delivered to the CTA. Built by the St. Louis Car Company, the number of these type of cars would eventually reach 770 (#1-50 and #6001-6720), dominating the CTA's fleet for decades. The first batch is placed into service on the Logan Square route. February 25, 1951 - The Dearborn Street Subway opens, connecting the Logan Square and Humboldt Park branches with downtown, terminating at LaSalle/Congress. Only 6000-series cars are in service there. The connector between the Milwaukee Line and Marshfield junction is closed (as are the Division, Chicago, Grand, Lake Street Transfer and Madison stations on it), though the section between the Lake Street "L" and Marshfield is retained for rolling stock moving purposes. December 9, 1951 - Service on the Westchester branch is replaced by buses. The western terminal for the Garfield Park line returns to Des Plaines Avenue in Forest Park. A/B skip stop service is implemented on both the Garfield Park and Douglas Park branches for rush hour service. Stations on the Garfield Park are left alone (in anticipation of demolition for the Congress Line), but Laflin on the main line and 14th Place, Homan, Drake, Lawndale and Kenton are closed on the Douglas Park. Roosevelt, Wood and Douglas Park stations are coded "Special Stops", served only by certain trains carrying special signs. February 3, 1952 - Service on the Douglas branch west of 54th Avenue is replaced by buses. May 4, 1952 - Service is discontinued on the Humboldt Park branch. September 20, 1953 - Garfield Park trains are rerouted onto street level operation over a 2 1/2 mile portion between Sacramento and Aberdeen, enabling construction of the Congress (now Eisenhower) Expressway. There were no stops between Halsted and Kedzie. During this period (1953-1958), A/B skip stop service is abandoned on the Garfield Park Line. Due to operating difficulties as a result of the construction, the Chicago Aurora & Elgin Railroad ceases operation east of Des Plaines, forcing passengers of the interurban line to transfer to and from CTA trains there. Eventually, the interurban folded. January 29, 1954 - Service is discontinued on the Normal Park branch. April 4, 1954 - Douglas branch trains are rerouted to the Loop via the old Logan Square connector and the Lake Street route to allow further construction on the Congress Line and the Congress Expressway. October 11, 1955 - Wells Terminal closes and is demolished. Garfield Park line trackage is extended through the old Wells Street terminal to connect with Loop elevated just south of Quincy, replacing the old Loop connection via Van Buren at Tower 8 (Wells/Van Buren). July 3, 1957 - Chicago Aurora & Elgin Railroad ceases all operations at noon. Many Loop commuters were unaware and caught downtown with no transportation home. October 7, 1957 - "L" service is discontinued on the Stock Yards branch and replaced by buses. December 1, 1957 - Service is discontinued on the Kenwood branch. At the same time, the last of the wooden cars are retired by the CTA. They had last been used on the Kenwood. June 22, 1958 - The Congress line opens in the median of the Congress Street Expressway (now the Eisenhower Expressway), replacing the Garfield Park line, which is demolished. Trains are through-routed to the Dearborn Street Subway at LaSalle/Congress station, to Logan Square. The Douglas branch is linked with the Congress Line. Only new 6000-series trains are allowed to run on the Congress Line, the centerpiece of the CTA at the time. November 6, 1960 - The first ever train-phone system is installed on North-South route trains, allowing motorman to contact Operations Control in the Merchandise Mart CTA offices. October 28, 1962 - Street level operation at the west end of the Lake Street line is replaced by a new elevated embankment, sharing the right of way with the Chicago and North Western Railroad. A new terminal opens at Harlem in Oak Park, replacing Forest Park a few blocks west. January 21, 1963 - The Chicago North Shore & Milwaukee Railroad ceases operation. The last major interurban in Chicago to close (and one of the last in the country), the North Shore right-of-way in Skokie and Evanston is purchased by the CTA. April 20, 1964 - Skokie Swift service begins on the old Skokie Valley tracks of the Chicago, North Shore and Milwaukee Railroad, running nonstop between Howard and Dempster Street. This service, provided expressly for commuters with a Park-n-Ride lot at Dempster, is made possible by federal dollars and is one of the first examples of what is today called "light rail". June 15, 1964 - The CTA receives the first cars of what are called the High-Performance family. The first of these 2000-series cars (#2000-2180) are placed in service on the Lake Street Line. The 2000s, built by the Pullman-Standard Company, are the first cars with air conditioning and had a number of other modern improvements, including sculpted fiberglass ends, remote-controlled destination signs, a new truck design, an electrical coupler (making them incompatible with older cars), more powerful motors and automatic cab signals (added later). The exterior was painted alpine white and mint green and the interior was unpainted. November 30, 1967 - The first automatic cab signal systems, designed to alert motorman to trains or obstacles ahead and automatically stop the train if necessary, are installed on the 2000-series trains of the Lake Street route. May 6, 1969 - The Englewood branch is extended to a new terminal at Ashland Avenue, 1/4 mile west of previous terminal at Loomis Blvd., which is demolished. September 28, 1969 - Service begins in median strip of Dan Ryan Expressway. The Lake Street line is routed through to Dan Ryan line via Loop elevated and the old Loop-South Side connector, abandoned in 1949. In conjunction with the opening, the first of the new 2200-series rapid transit cars, built by the Budd Company, are delivered. The 2200s (#2201-2352) are constructed of unpainted corrugated stainless steel, which is both lighter and more fire-resistant. The air conditioning and trucks are also improved. They are the last with old-style "blinker" doors (the kind that fold in when opening). 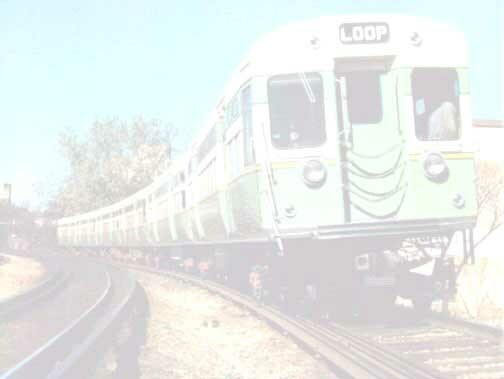 September 30, 1969 - The Loop Shuttle line, a set of trains that make a continuous circuit around the Loop on the inner track, begins operation. February 1, 1970 - Service is extended northwest of Logan Square to Jefferson Park, using the median strip of the Kennedy Expressway. The old Logan Square terminal and yard are demolished to make way for the subway connector between Logan Square and the Kennedy Expressway. Meager yard facilities are provided at Jefferson Park. April 30, 1973 - Ending a service begun in 1920, the "L" carries its last freight run over the North Side tracks. November 8, 1973 - Overhead trolley wire on the Evanston route is replaced with third rail. Prior to then, trolley poles were raised and lowered at the South Blvd. stop. This allows the retirement of the last of the 4000-series cars, the oldest dating back to 1913, which were last running on the Evanston Line. August 29, 1974 - The first two women are hired for rapid transit service. October 6, 1976 - The first of 200 new 2400-series "L" cars, built by airplane manufacturer Boeing-Vertol, are delivered. The 2400s (#2401-2600) are the first with sliding doors, making them handicap accessible. For the first time, the motorman's cab was made a dedicated crew space, no longer accessible to passengers when not in use. September 30, 1977 - The Loop shuttle is discontinued. April 3, 1981 - The inaugural runs of the first 300 2600-series cars (eventually 600) are made. The 2600s (#2601-3200), made by the Budd/Transit America Company, had increased interior floor space and seats that fold up for wheelchairs. After completing the order, Budd/TA stopped making rail cars. March 4, 1982 - Due to structural defects in bridge over Illinois Central Railroad, service on the Jackson Park branch is suspended south of 61st Street. December 12, 1982 - Service is restored on the Jackson Park branch as far as the University Avenue stop after a $2 million renovation. The defective bridge was later demolished. February 27, 1983 - The first segment of the O'Hare extension opens from Jefferson Park to River Road (now Rosemont), using the Kennedy Expressway median strip. A new yard is provided at Rosemont. September 3, 1984 - The final segment of the O'Hare extension opens from River Road to O'Hare. February 8, 1988 - The Quincy/Wells station reopens after a three years renovation, restoring it to its original 1987 look with rehabilitated wood work and pressed tin interior and exterior platform and the installation of reproduction signage, lighting and advertisements. February 24, 1989 - The first phase of the new tri-level Clark/Lake station opens. The station connects the "L" (where the Lake-Dan Ryan, Ravenswood and Evanston trains run), the Dearborn Street subway (the O'Hare-Congress-Douglas) and a street-level entrance in the new State of Illinois Center. February 9, 1992 - The CTA enacts one of its periodic service cuts. The following "L" stations are closed: California/Lake, Harvard, Wentworth, and Grand/Milwaukee. Chicago/Milwaukee is changed from an A Station to an AB Station, compensating for the closure of Grand. April 13, 1992 - A tunnel under the Chicago River collapses, flooding Loop basements, service tunnels and the CTA subway system. Service is disrupted in the State Street subway for 18 days and in the Dearborn Street for 24. August 27, 1992 - The first of 256 new 3200-series rapid transit cars are delivered. The 3200s (#3201-3457), built by the Morrison-Knudsen Corporation (who had also rehabilitated 45 5-50-series cars in 1985-1986), integrate solid state logic and microprocessors for propulsion and readopted unpainted stainless steel for the exterior (last used on the 2200-series). Some seats were taken out to make more room for standing passengers. Equipped for one person operation, the motorman's cab extends the entire width of the train. The 3200-series cars run on the Ravenswood, the Midway (after it opened a year later) and, modified with trolley pantographs, the Skokie Swift. December 10, 1992 - The last 6000-series cars operate on the Evanston Express. These cars, which dominated the CTA fleet at a total of 770 units, were the prototypical Chicago "L" car for generations of riders. February 21, 1993 - A new connection opens between the Dan Ryan line and the State Street Subway. Dan Ryan trains are routed through to Howard Street forming the Red Line. Englewood and Jackson Park elevated lines, previously linked with Howard Street, become linked with Lake Street line via the Loop elevated, forming the Green Line. New destination roller signs on trains and route maps conform to the new color coding system. October 31, 1993 - The Orange (Midway) Line, the first new "L" line in a decade, opens between the Loop and Midway Airport, utilizing existing railroad rights of way and new elevated structures. The Midway begins operation from day one with one person operation with 3200-series cars. December 17, 1993 - The last of the 2000-series cars run on the Lake-Englewood-Jackson Park Green Line. January 9, 1994 - The Lake-Englewood-Jackson Park Green Line closes for an extensive renovation project lasting more than 2 years. A great deal of controversy raged during the two year rehab, including debates over station closings, retention of nighttime "owl" service and the date of reopening. January 30, 1994 - The Madison/Wells station is closed and demolished so that work on the Washington/Wells station could begin. On Friday, February 4th, the Outer Loop (west) station house is damaged by fire. October 2, 1994 - The CTA officially changes the last of its route names to color designations. (Routes still have proper names, however.) The lines are now as follows: Red Line (Howard-Dan Ryan); Blue Line (O'Hare-Forest Park-54/Cermak); Orange Line (Midway); Brown Line (Ravenswood); Purple Line (Evanston); Green Line (Lake-Ashland/63-East 63rd); and Yellow Line (Skokie Swift). February 2, 1995 - A/B skip stop service is discontinued on the Brown Line (Ravenswood) and one person operation begins. April 28, 1995 - Skip stop service, running rush hours only on the Red (Howard) and Blue (O'Hare) Lines, is suspended. With the Green Line reentering service a year later with all stop service, an era of CTA operations passes into history. July 17, 1995 - The new Washington/Wells station opens on the Loop, replacing both the Randolph/Wells and Madison/Wells stations. August 13, 1995 - The Lawrence station is reopened, effective 7am. May 12, 1996 - The Green Line reopens after a renovation project lasting more than 2 years. Owl service is retained, but the lines reopen with seven fewer stations: Homan, Halsted, 58th, 61st, Harvard, Racine and University are closed. Jackson Park trains terminate at Cottage Grove Avenue (East 63rd) while future of elevated segment east of there to Dorchester remains undecided. A new station at Laramie and a rehabilitated station at Ashland remained unfinished, opening later in the year. The California/Lake station, closed in the service revision of 2/9/92, is rebuilt and reopened. May 30, 1996 - The Jackson-Van Buren mezzanine of the State Street Subway is closed for reconstruction, to be finished in the colorful Deco style of Roosevelt/State. The work, completed by the City of Chicago Department of Public Works, is to include the installation of elevators. June 2, 1996 - The Randolph-Washington mezzanine in the State Street Subway is closed for renovation and the installation of new elevators. The Washington-Madison entrance, formally a part-time mezzanine, became open 24 hours for the duration of the project. July 21, 1996 - The section of the State Street Subway's continuous platform that served the Washington station is split into two seperate stops as part of the stop's renovation (see above). The north end of Washington was the "Lake-Washington" stop for "L" transfers and the south end was the "Washington-Madison" stop for Blue Line transfers. Once the work was completed, the station became unified again. November 29, 1996 - The first station-specific timetables are posted on the Brown Line. They are also printed as paper brochures and are eventually implemented on all "L" lines. June 22, 1997 - The new Library-State/Van Buren station opens, replacing a station demolished two decades before, with a direct connection to the Harold Washington Library. August 18, 1997 - A new automated fare collection system, using magnetic fare cards instead of money and tokens, goes into service and the first wave of station agents leave their booths, becoming customer service agents, on the Green and Orange Lines. September 14, 1997 - The last of the station ticket agents leave their booths. September 27, 1997 - The CTA reaches a decision on the fate of the Cottage Grove-Dorchster segment of the Green Line: with less then 24 hours of public notice, city workers move in and dismantle the 105-year old "L" line. The lack of communication reinforces increasing hostility toward the CTA from neighborhood residents. October 1, 1997 - The CTA celebrates its 50th anniversary. October 12, 1997 - The Loop celebrates its 100th anniversary. November 9, 1997 - The Red and Blue Line trains go to one person operation, the last on the system to do so. The increased time it takes to operate, though actually only a few minutes total per trip, nevertheless requires more trains per day, especially during rush hour. For safety reasons, trains continue to use conductors in the subway getting on at Fullerton and off at Cermak-Chinatown on the Red Line and at Division and Clinton on the Blue Line. November 18, 1997 - The wisdom of having two stops for Washington/State (see July 21, 1996 entry) is realized and the dual stopping pattern is re-instituted effective at 10 a.m. The north end is again considered a separate station, alternately referred to as "Lake-Washington" or sometimes simply as "Lake". On maps, Lake provides the free transfer to the elevated at State/Lake and Washington provides a free transfer to the Washington/Dearborn subway station through a mezzanine walkway and a platform-level tunnel. April 27, 1998 - The CTA institutes some of the largest service cuts in its history. Under the Booz-Allen Hamilton Service Plan, numerous bus lines are cut and, while most rail service is unaffected, Owl Service is cut on the Green, Purple and Blue (Douglas) Lines. Additionally, the Douglas branch no longer operates on the weekend. Shuttle service is substituted on the East 63rd Branch, meeting Harlem-Ashland/63 Green Line trains at Garfield. Evanston Express service is discontinued between the 4th and the 8th due to a shortage of passenger equipment and snow-fighting equipment. Evanston Shuttle service is maintained between Linden and Howard. Some northbound Ravenswood trains are turned around at Belmont to cover for the suspension of Purple Line Express service. The morning of the 5th, the third rail on the Blue Line is damaged north of Jefferson Park, resulting in the damage of 64 Blue Line rail cars and ultimately, the suspension of service between Jefferson Park and O'Hare. Shuttle buses take over for that section of the Blue Line. Service on the outlying sections of many lines - Evanston, Lake, Ravenwood, Douglas - is disrupted during the initial snowfall. Design flaws disable nearly 300 2600-series cars, causing a severe shortage of rolling stock. Cars that are repaired in short order are sent back into service, only to be damaged soon thereafter. To cover base service, a number of cars are transfered around the system. Brown Line 3200s found their way to the Green Line; Brown and Orange Line 3200s, Green Line 2400s, and Purple Line 2600s went to the Red Line; Brown and Orange Line 3200s came to the Blue Line (sometimes in solid eight-car trains! ); and Brown Line 3200s went to the Purple Line. Due to a reduction in the number of runs, conductors are placed back on trains. CTA office employees are placed out in the field to help with crowd-control and to provide information to thousands of confused and angry riders. June 1, 1999 - The CTA retires tokens for good, accepting only Transit Cards and cash fares (on buses and in turnstiles) as payment. June 14, 1999 - Crews close State Street from Chicago Avenue to Superior to begin renovation work at the Chicago/State subway station. Work there is being completed by the City of Chicago's Public Works Department in cooperation with the CTA. The station remains open through the construction and is expected to be complete in August 2000. The $23 million renovation will add 10,000 square feet of additional space in the mezzanine and will make the station ADA compliant. The reconstruction includes new wall treatments, new tile floors, new flourescent lighting, modern up-to-date station signage, and new stainless steel fare controls. June 25, 1999 - The Grand/Milwaukee station, closed in the service revision of 2/9/92, is reopened effective at 6am. Reactivated in response to increasing population around the station, the mezzanine recieves a thorough cleaning and new fare equipment while the platform is given a fresh coat of paint, new signage, and a deep scrubbing. March 25, 2000 - The last of the conductors are pulled from the "L". Conductors had continued to be used for safety reasons on the subway portions of the Red and Blue Lines for some time after their removal from the rest of the system. Installation of safety mirrors and monitors, as well as the inauguration of the automated voice announcement system allowed these conductors to be removed, ending an era in "L" history.